Blue Ridge Honey Co. is a family business, owned and operated by Bob & Suzette Binnie, located in the Blue Ridge Mountains of Northeast Georgia. Our bee yards are located in Northeast Georgia, Western North Carolina and South Georgia. Our honey is pure, natural and raw. We do not pasteurize or micro filter our honey. We are inspected and approved through a third party Food Safety and Quality Audit conducted by NSF Cook & Thurber as is required by many large grocery stores. We are also licensed by the Georgia Department of Agriculture and inspected by the Commodities Inspection Division of the Georgia Dept. of Agriculture. We wholesale & retail honey, pollen, and beeswax products, as well as produce bees and queens for sale. 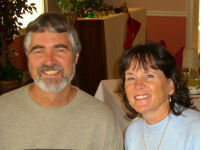 Bob began commercial beekeeping in 1981 in Oregon & has been involved in commercial beekeeping in 10 states. He handles all beekeeping and sales while Suzette manages the office, website and shipping dept. 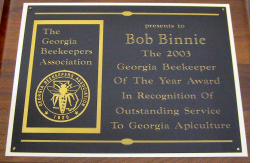 Bob is a past President of the Georgia State Beekeepers Association (2008 and 2009), and has served 2 terms on the Board of Directors. He is a past President of the Northeast GA. Mountain Beekeepers Association. Bob is the past President of the Macon County Beekeepers club in NC. He was voted the 2003 Georgia State Beekeeper of the Year by the Georgia State Beekeepers Association. He is often a guest speaker at many clubs in the southeast and is often asked to teach classes at Beekeeping Schools.